Good morning from beautiful Hamburg and welcome to our Daily FX Report. The USD almost reached a 14 month low against the EUR. Furthermore we have interesting data from Japan. Anyway, we wish you a good trading day. The USD has been trading near a 14 month low versus the EUR and reached the level at 1.4876. This was the weakest level since August 2008. The JPY dropped against the USD to 0.8984 on speculation that the Bank of Japan will keep the interest rate unchanged today amid the nation`s fragile economic outlook. Yesterday the GBP/USD increased 0.79 % and is now trading in the near of 1.5970. Furthermore, the USD may decline versus the GBP for a second day before a government report forecasts that the U.S. consumer prices gained last month and curbing demand for safe haven assets. The JPY traded against the EUR at 133.37. In Japan the nation’s producer prices fell for a ninth month in September as oil traded lower than the last year`s levels and demand for materials waned, said the Bank of Japan. The consumer prices excluding fresh food slid 2.4% in August from a year earlier, topping July’s 2.2% decline, said the statistics bureau. This was the sharpest drop since the survey began in 1971. Since the middle of September, the GBP has been trading in a bearish trend against the CHF. 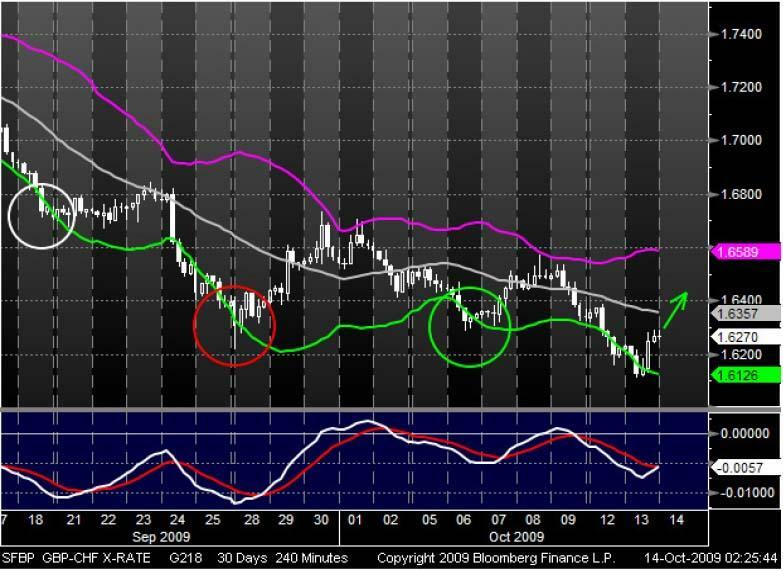 During this time, the currency pair could always recover when it touched the bottom Bollinger Band and climbed up to the middle or even up to the upper Bollinger Band. Recently, the GBP touched the bottom Bollinger Band and recovered again. Furthermore a crossing MACD through the signal line from below which may indicate a bullish trend. Since the beginning of October, the USD has been trading in a sideway trend channel against the CHF. 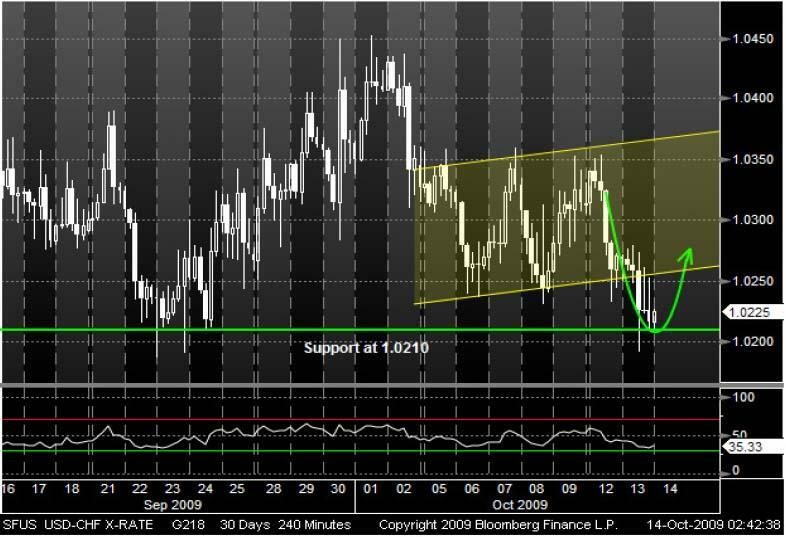 Recently, the USD left the trend channel and touched its support line at 1.0210. After touching its support it seems that the support is strong enough to hold the prices and could care for a pull back in the trend channel. Also the RSI may indicate an increasing trend for the currency pair.